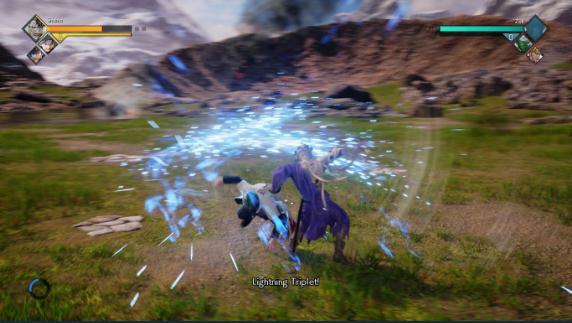 Here is some of the mechanics featured in Jump Force! If you take a look carefully at the bottom-left corner of this screenshot, you will notice a blue circle. This is your movement gauge circle, which will be consumed via dodging or escaping. RB is the button you click/press in order to block. To sidestep, or in simpler terms, dodge (or evade), simply do so by pressing RB and leaning LS (Left Stick) Left, Right, or Down at the same time (RB + LS Left, RB + LS Right, and RB + LS Down)! This will allow you to dodge left, right, below, and will help you avoid hits or approach your opponent in a more defensive manner! RB + LS Up or LB standalone, however, will allow you to chase your opponent. This is a powerful approach boost! It can be used to follow-up into an X or Y attack! You can escape a combo by pressing LB while you are being attacked and/or combo’d! 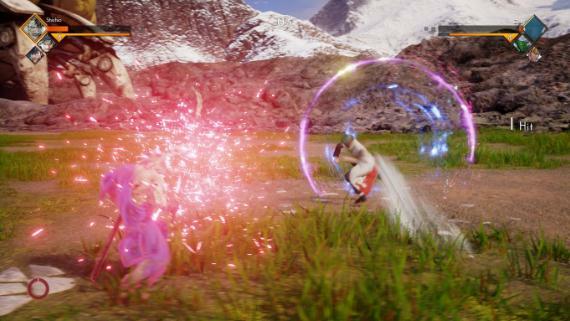 As depicted by this screenshot, you will have known to have escaped a combo when your character flashes a pink outline, instantly warping you away from your opponent, turning your movement gauge circle red, telling you that you are out of movement gauge. No matter how much your movement gauge is filled, remember that escaping once will consume your WHOLE gauge, so use it wisely! You can also counterattack by pressing LB, X, or Y IMMEDIATELY before the opponent’s next move hits you, allowing you to either counterstrike or warp away for a counterstrike! Timing is very heavy for this mechanic, but worthwhile!